Join us for a night of fun and music. Rachel Little will be teaching yoga from 5 to 6:30. LIMITED TICKETS FOR PIZZA FROM 6 TO 8. At 7pm, Hoot and Holler will entertain with music in the tradition of American Folk Music. Hoot and Holler are the sum of two parts: guitarist Mark Kilianski and fiddler Amy Alvey. Hoot and Holler is inspired by the enduring spirit of traditional Appalachian mountain music. Their song writing is simple, honest and fresh to the ears. Both Mark and Amy are Berklee College of Music alumni, and this allows a polished technique of conservatory training in tandem with the grit drive and soul of folk music. 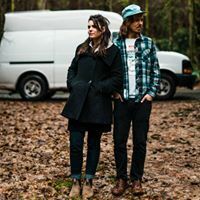 Each are songwriters dedicated to honing their craft, both equally influenced by wordsmiths like Gillian Welch and Townes Van Zandt as they are to authentic mountain musicians like Roscoe Holcomb and Ola Belle Reed. After spending the better part of 2016 living in a camper van while playing shows across the country, they now call Asheville, North Carolina their home.